Image source: Screenshot (Google). Screenshot was taken on 2019.04.15, 14:04 CEST. 7 days ago (on 2019.04.08) I made a giveaway on dPoll. Statistics: 9 accounts voted on the poll. 4 accounts voted for Manchester United. 3 accounts voted for FC Barcelona. 2 accounts voted for Draw. 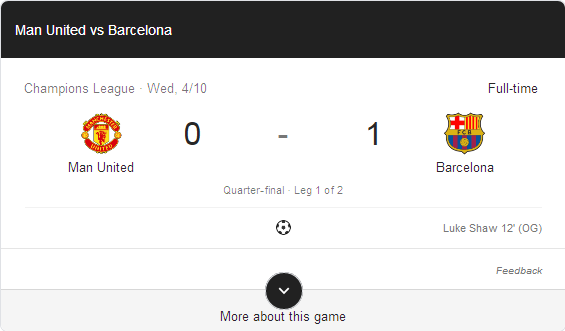 The winner of the match is FC Barcelona with 0-1. This blog post generated $0.212 SBD and 0.502 Steem Power author rewards. The winners are @russia-btc ($0.071 SBD), @akomoajong ($0.071 SBD), @bluerobo ($0.07 SBD), because voted for FC Barcelona. The rewards are already sent! Congratulations to all of you! The rewards are small, because people are not really supported (upvoted) the giveaway. Most of the upvote values the post received were came from free upvote bots. I don't understand why people don't supported (upvoted) it. Especially after I am giving away 100% of the liquid rewards from these giveaway posts. I will still continue to do more giveaways. Let's choose the sport of my next giveaway. Vote for the sport of my next giveaway. Try some eSports (for example Dota 2, League of Legends, Heroes of the Storm, Counter-Strike: Global Offensive, Overwatch).